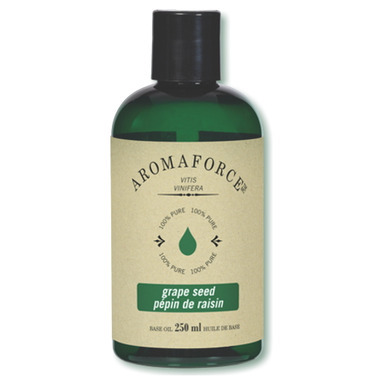 Aromaforce Grape Seed Essential Oil is an antioxidant oil appreciated for massage. Grape seed oil is an excellent massage oil. It penetrates skin well bringing it moisturizing regenerating and protecting effects. Grape seed oil penetrates skin well, bringing it moisturizing, regenerating and protecting effects. Grape seed oil is excellent for massage. So far it has been helping to clear up my face. I use it as an oil cleanse before I was my face with a foam cleanser. This oil has no smell, which might be a good thing for sensitive people. I use it to take off make up and clean skin before I go to bed. It absorbs very well and my skin feels very good after. It's one of the more reasonably priced oils and high in Linoleic Acud which is good for acne prone skin. I use this product to wash my skin. the results are amazing. i've been using it for quite a while and have very nice skin. its also good for giving massages! i love this product and will buy it again for sure.